Tekno branded box in the Middle East series. Excellent bulldog mascot on the door mirrors. Nice exhaust and air cleaner stack. High detail under the cab. 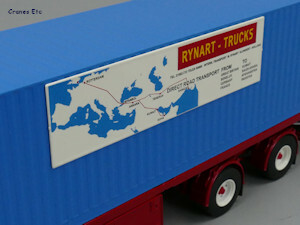 Detailed rear end of the trailer. 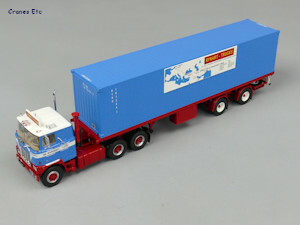 The Mack F700 was produced between 1962 and 1981. 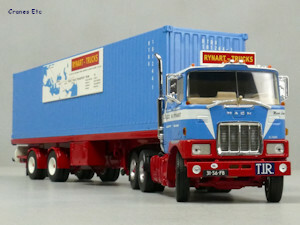 This model is in the colours of Rynart, the Dutch haulage company. 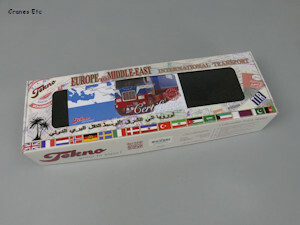 The model comes in a Tekno style box decorated in the Middle East series. The packaging is high quality with the model enclosed within black foam rubber. There was no damage or missing parts on the review model. Mirrors and an aerial have to be fitted to the Mack. 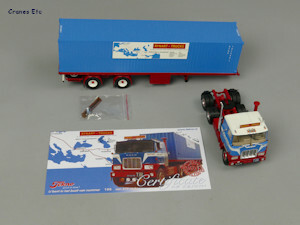 A Certificate of Origin is included which is uniquely numbered within the limited run of 275 models. There is no information about the real truck. 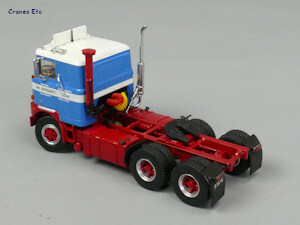 The Mack chassis is very good. 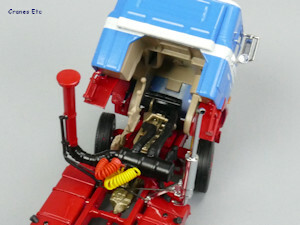 The transmission and suspension parts appear to be metal, and the gearbox and engine are a gold plated colour. 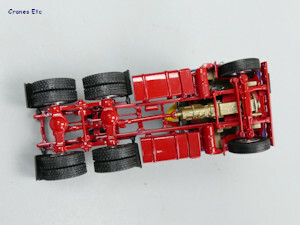 There are different tyres on the driven and steering axles, and the metal spoked wheels are excellent. 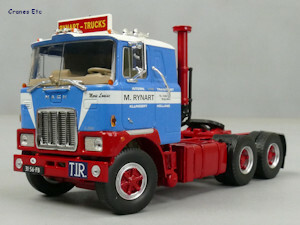 The cab is very detailed with a Rynart sign, lights and air horns on the roof. The chrome mirrors look good and they have the bulldog mascot embossed on the back. The chrome front grille is really good and the graphics are high quality and include a T.I.R. sign. 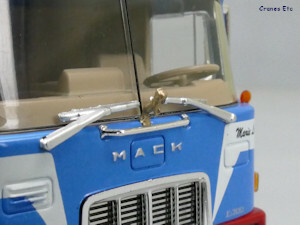 A high point of the detailing at the front is the tiny gold plated Mack bulldog. Behind the cab is a nice exhaust and air intake, and there are coiled lines. At the back the lights have plastic lenses. 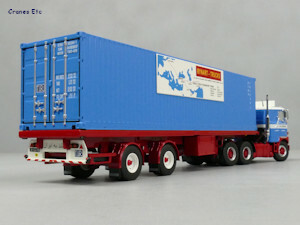 The trailer is solidly made and heavy. It is a classic style and underneath there is the old style of landing legs. The container is metal and is permanently fixed to the trailer. It has a very nice ribbed structure, and has detailed graphics at the front. On the sides are large Rynart signs. 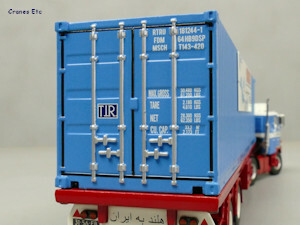 At the back of the container the locks are highlighted with silver paint and there are many small graphics. 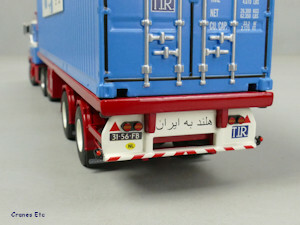 At the rear of the trailer there are more graphics including some in Arabic. Replica timbers in plastic are provided, and they allow the trailer to be supported on the landing legs in a level position. The Mack has a decent steering angle and it rolls well enough. 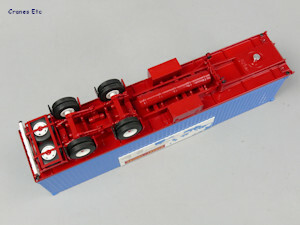 It has a tilting cab which works well and it reveals a detailed engine. The trailer rolls well when connected to the tractor, or can be posed on the support timbers. 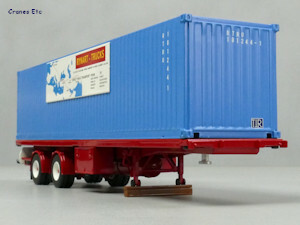 The container is screwed to the trailer deck. This model has a high metal content and is high quality. The paintwork and graphics are of a very good standard. The model is fully priced for a model of this type. 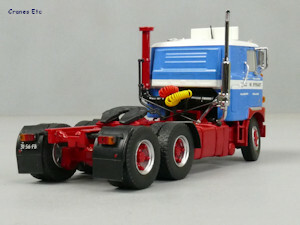 It is nice to finally see a Mack F700 model and Tekno has done a very good job with it. The high point is the standard of detailing on the Mack. The model appeared in mid 2018. Fuel tank has a nice filler cap. 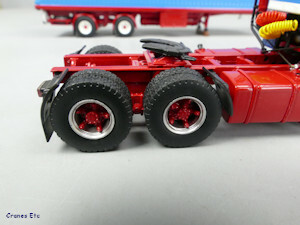 Mack chassis is very detailed.